We @downtownfarm in Livermore, CA hereby pledge that we will buy Tim Preston @winequester in Santa Clara one (1) poop-resistant computer (code-named IPAD = “I Poop All Day”) if and only if we are not able to barter a few farm products of mainly emotional value (e.g. eggs from our chickens, honey from our bees, kale from our raised beds, plums from our fruit salad trees) in exchange for one or more (1+) poop-resistant computer (code-named iPad) from tribe leader Steve Jobs whose people see their home in an apple tree in Cupertino, CA. We have until the last full moon of this year (2010, December, 21st, 08:13 am UT) to fulfill our love commitment. Should we @downtownfarm indeed manage to tickle Steve Jobs in his green spot then @winequester has not obligation whatsoever unless his heart tells him otherwise. If we @downtownfarm, however, fail to tickle Steve in his green spot then @winequester will receive the cheapest poop-resistant computer (iPad) available on that date. This battle of the wits was the spontaneous result of a discussion on extracting monetary value from geo-spatial platforms (e.g. geo-twitter, foursquare, geowalla, loopt, brightkite, …). We have the following hypothesis: “We try to earn money so we can buy/create opportunities for us and our friends that bring us happiness. Hence … it is happiness we are after and money is just a convenient indirection to achieve it. Therefore I conjecture that if a business deal directly creates happiness the scenic by-pass through the land of green bucks is not a needed”. We are scientists. 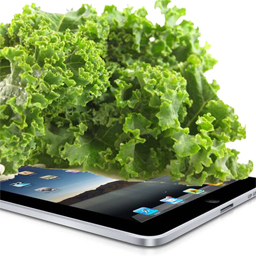 We like to experiment to validate or discard our conjectures: the kale4ipad.us or ipad4kale.us idea is our experiment. A similar idea is to http://refarm.us with an emotional tool. Don’t pluck us: http://cluck.us.